Place the pumpkin, leek, onion, garlic and broth in a large pot over medium heat and cook for 15 minutes or until the pumpkin is soft. Remove from the heat and combine with a hand mixer until the cream is velvety soft and without lumps. Add the heavy cream now if you’d like. Taste and adjust the salt and pepper to your liking. Serve hot with a spoonful of yogurt. If you don't have a hand mixer, you can use a regular blender, you should let it cool first because the heat may cause the blender to explode and burn you. 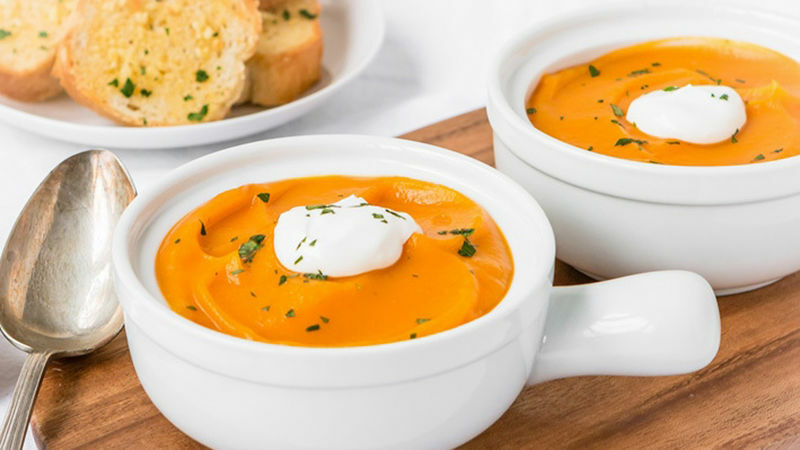 This pumpkin soup is a classic from my mother's kitchen. I remember that she would prepare it often and serve it with pieces of white cheese. If you would like to prepare a completely vegan version, just don't add cream and yogurt. It'll still be delicious! Enjoy!